This home is truly move in ready! Large corner lot is low maintenance w/sprinkler system. Mbdrm has e/e door, oak lam. flooring & the other 2 bdrms have new carpet. Tile thru-out the remainder of the home. Beautiful gas fireplace in the family room. Wood shutters thru-out. In 2018, owner had int & ext painted; new copper piping for water shut off; garage remodeled w/epoxy flooring, workbench, & cabinets; new ceiling fans in fam room & patio; granite countertops in kitchen; custom screen doors & sunscreens added; new outdoor garage lights & security lights on perimeter. Elec & gas available for the clothes dryer. A/C & gas furnace checked & serviced in October 2018. Designated outlet in garage for golf cart. Home has been maintained & updated. New LED lights in kitchen. Come take a look! Directions: Westbound on Union Hills, turn north on Country Club Parkway. Turn right on Westbrook Drive. Turn left on N. 87th Dr. Your next house is on the corner of W. Sierra Pinta Dr. and 87th Dr. Approximate size: 8838.00 sq. ft. Please, send me more information on this property: MLS# 5901375 – $359,900 – 8788 W Sierra Pinta Drive, Peoria, AZ 85382. 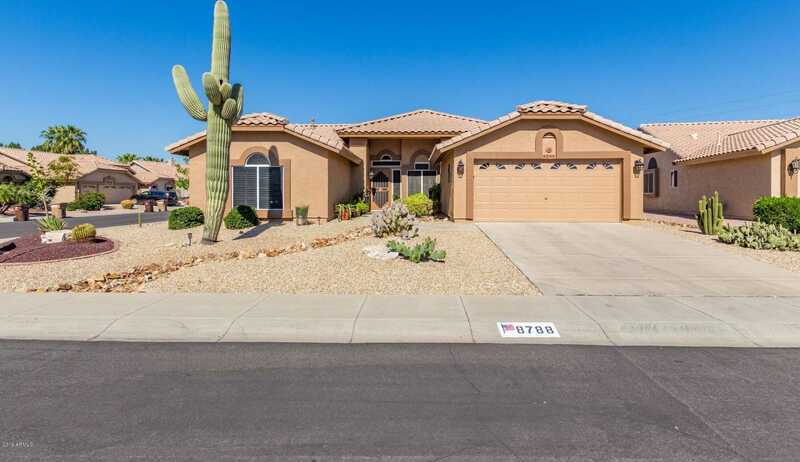 I would like to schedule a private showing for this property: MLS# 5901375 – $359,900 – 8788 W Sierra Pinta Drive, Peoria, AZ 85382.